Attached is an audio snippet from a motion hearing “Scheidler v Executive Director, Commission on Judicial Conduct and Associate Director, WSBA, et. al.” at which I objected to a WA lawyer, under RCW 2.28.030 from acting as judge when the judge is ‘directly interested’ in the subject matter of the case. Also noted in my pleading is the ‘ethical requirement’ that states judges shall disqualify themselves under the Code of Judicial conduct CJC 2.11, when a judges ‘family’ is interested in the subject matter of the case. In this case the Judge’s son is a lawyer. Clearly, a judge has a VITAL interest at stake, as the Commission on Judicial Conduct has the absolute power to remove the judge from his bench without consequence in the way the CJC achieves the judges removal. (See RCW 2.64.080 privilege from suit). 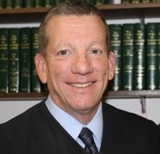 Additionally, in this case, Judge Keith Harper’s son is a lawyer… hence his son’s interest is involved in that the WSBA is a party and the judge’s son is susceptible to the same retribution if the judge rules against the WSBA. Please listen to how Judge Keith Harper addresses me and tells me to go find a venue on the moon or MARS when I try to discuss these conflicts and by law he must disqualify. To hear John Worthington’s testimony listen to the audio below. Needless to say, anyone who recognizes how the “legal establishment” has commandeered our ‘justice system’ and uses this ‘complete power’ to make ANY decision they want solely for their own enrichment — PLEASE GET INVOLVED! PLEASE PASS THIS SITE TO ALL YOU KNOW! PLEASE CONTACT YOUR REPRESENTATIVES AND VOICE YOUR CONCERN. …. AND PLEASE “like what we do” by noting your approval on the social sites noted below. THANKS TO ALL WHO HAVE WRITTEN ME WITH ENCOURAGEMENT AND ESPECIALLY MY THANKS TO BRUCE GAMBILL, CAMEO MASSEY AND JOHN WORTHINGTON FOR ALL YOU DO TO HELP MOVE THIS ISSUE INTO THE PUBLIC ARENA. It truly shows the confidence of their arrogance, that they would come right out and make a statement like this. They know they really don’t have much to fear in the way of repercussions. They have the WSBA, and other agencies behind them to cover their asses. Great work Bill…this is happening all over the Country and needs to be “out there”….this type of theft can, and is, happening to so many people who believe the Probate Court is a necessary intervention in order to protect the deceased’s assets. Unfortunately, this is proving to be quite the contrary. There is no more prime target than a dead man’s legacy….even with a Will!! Time to Expose. See also 28 USC 455 on mandatory recusal of all “magistrates, judges and justices” in any case in which there is even the appearance of conflict of interest that may compromise the standing and perception of the judiciary as impartial. Note in the case of the Supremes and Bush v Gore: Scalia had a son working for the law firm litigating the case in Florida and stood to gain, and did , with the selection of Bush; O’Connor was witnessed by six people at a cocktail party, before the election results were in, that she hoped Gore did not win because she wanted to retire and did not want Gore appointing here replacement; Thomas’ wife was working at vetting candidates for the Bush transition and full-time teams and of course stood to gain and did gain with the selection of Bush by the Supremes 5 to 4. A Judicial coup d’etat no more legal and Constitutional than the coup in Ukraine. In little Vantucky there is a sub-rosa cult of people who fancy themselves “Pioneer Stock” or “Settler Stock”. they include former judges like John Wulle, they include owners of local enterprises, they include elements from the Columbian, they are generally Calvinist in theological orientation (Calvinism preaches predestination of the elect and that attained wealth and power are proof of being in God’s favor) and elements on the City Council, elements in the Clark County Sheriff’s Office, Vancouver Police, elements in Battle Ground and Amboy, and they basically see themselves as “Antheria” a metaphor for male (they are very patriarchal) reproductive organs on some plants that produce anti-bodies to “invasive species” that threaten the “genetic purity” of the garden with “hybridization”. By invasive species they mean non-whites, immigrants, Jews, counter-culture types, non-English-speaking, non-“Christian” (their type), gays, etc. They not only fix jobs and embellish their meager resumes with meaningless and incestuous awards and tittles, and in private-sector employment not necessarily a crime, but in public-sector employment, nepotism, cronyism, political patronage, job fixing are all crimes as well as torts. Jobs in public employment belong to the people and are not tradable resources for private use and patronage. Like the vampires they are, they fear sunlight, transparency, accountability and discovery of their real nature and intentions.